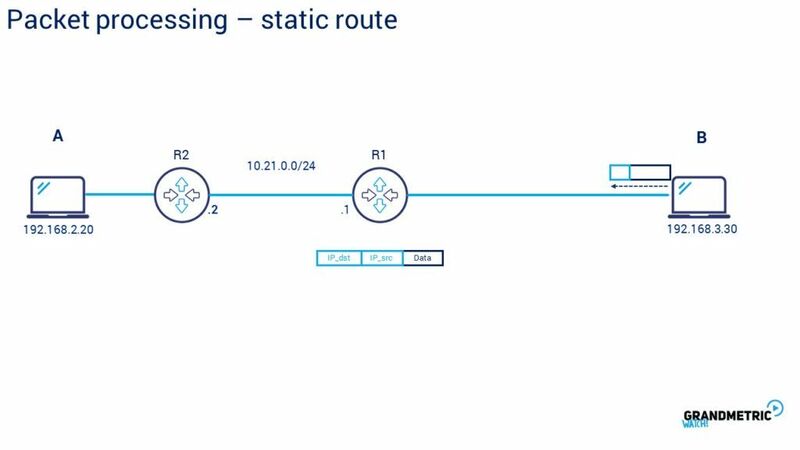 Static routing is often the fastest way to achieve connectivity in IP routed networks. 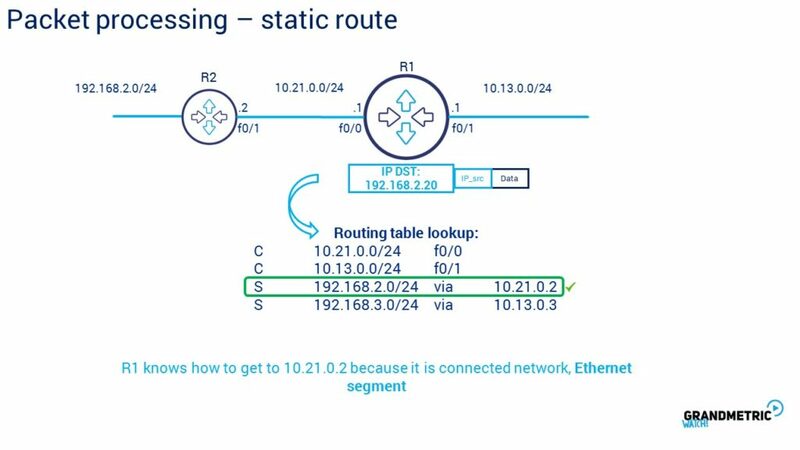 As you already know from previous video the static routing is configured always by hand of administrator and is suitable for scenarios where infrastructure is relatively not complicated. Here is the example of how to configure router 1 to achieve desintante network a and b. From the r1 perspective the netwok B is behind Router 3 and network a is behind r2. So we simply need to tell this to router 1. 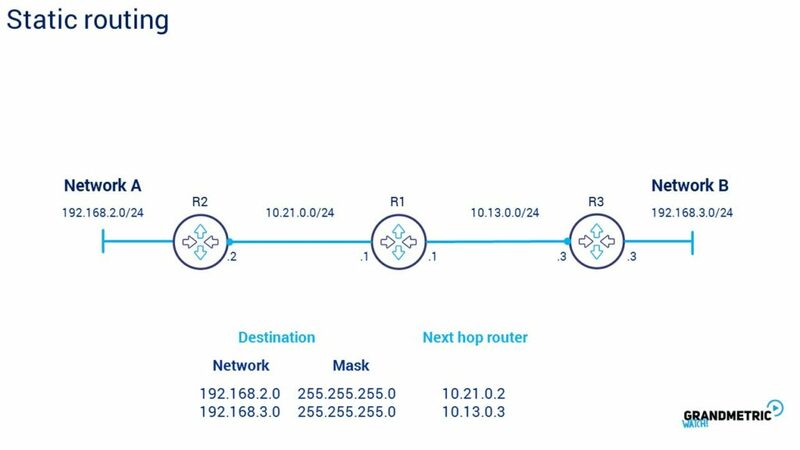 R1 network A which is 192.168.2.0/24 and tell that to get there router 2 needs to send the packet to next hop of 10.21.0.2 which is R2 IP address. In the same scenario configuring static routing to network B we tell the R1 to get to 192.168.3.0/24 it needs to forwards packet towards next hop of 10.13.0.3 whixh is Router 3. And following this rule we have just configured the static routing on router 1. 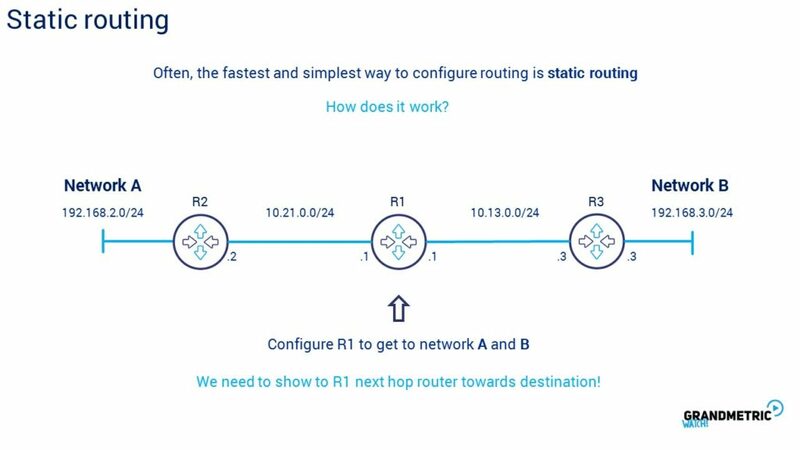 By the way it is very important to remember that routing is the proces hop by hop. So to complete the configuration always think about all hops and all directions. On real Cisco router the configuration will look like this… you need to enter the configuration mode and configure exatly the same thing that we did before verbaly. 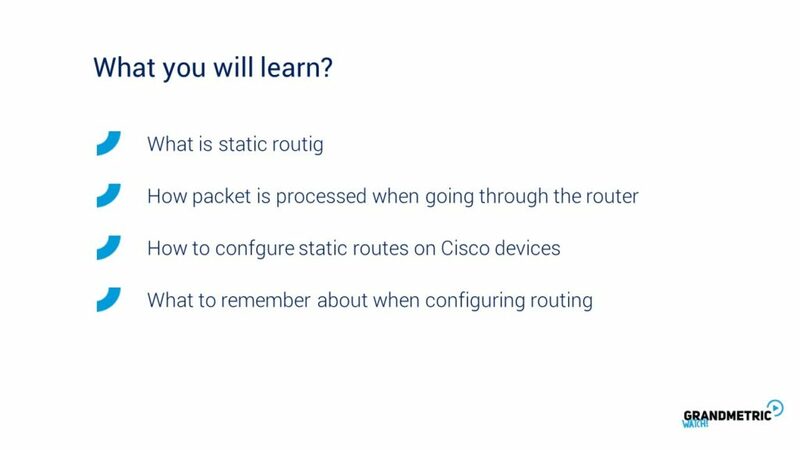 So when you configure the static lets follow the proces of routing the packet. Pakcet is sent from computer B to computer A meaning that in dst field of ip header there is 192.168.2.20 and source ip of header is 192.168.3.30. packet comes to router 1, frame is decapsulated and packet is staring to be analyzed. Router 1 looks into IP hedaer , specificaly into IP dst field of header where destiantion IP is located. Then consults the local routeing table to find the best match. Router has static route configured to 192.168.2.0/24 via next hop of 10.21.0.2. Now router know what interface to use to send the packet but there is one more thing to know before sending the packet. 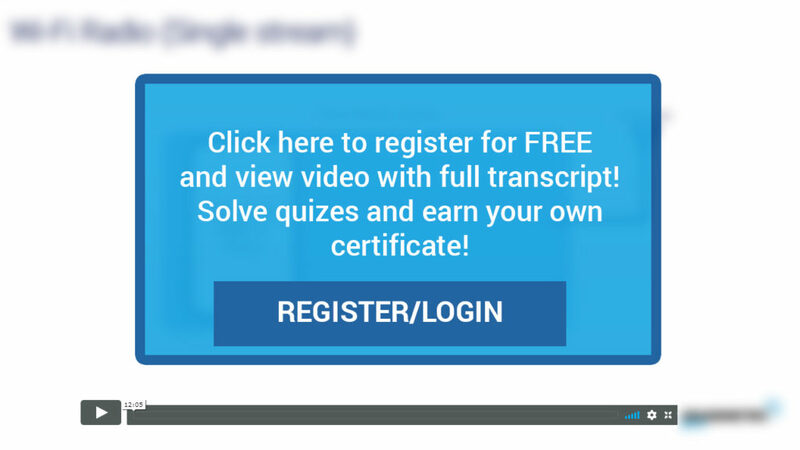 Because its Ethernet link router needs to encapsulate the packet with the frame. 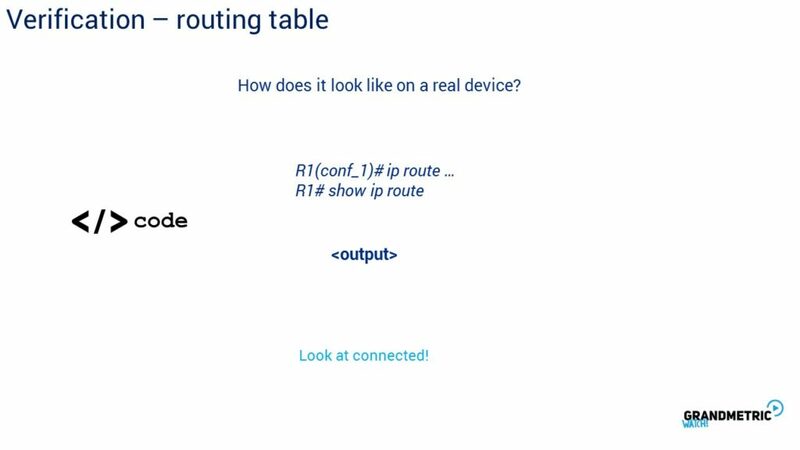 And this frame needs to have destination MAC address of next hop router.